Gaius Sallustius Crispus, usually anglicised as Sallust (/ˈsæləst/; 86 – c. 35 BC), was a Roman historian, politician, and novus homo from an Italian plebeian family. Sallust was born at Amiternum in the country of the Sabines and was a popularis, an opponent of the old Roman aristocracy, throughout his career, and later a partisan of Julius Caesar. Sallust is the earliest known Roman historian with surviving works to his name, of which Catiline's War (about the conspiracy in 63 BC of L. Sergius Catilina), The Jugurthine War (about Rome's war against the Numidians from 111 to 105 BC), and the Histories (of which only fragments survive) are still extant. Sallust was primarily influenced by the Greek historian Thucydides and amassed great (and ill-gotten) wealth from his governorship of Africa. Sallust was probably born in Amiternum in Central Italy, though Eduard Schwartz takes the view that Sallust's birthplace was Rome. His birth date is calculated from the report of Jerome's Chronicon. But the New Zealander Ronald Syme suggests that Jerome's date has to be adjusted because of his carelessness, and suggests 87 BC as a more correct date. However, Sallust's birth is widely dated at 86 BC, and the Kleine Pauly Encyclopedia takes 1 October 86 BC as the birthdate. Michael Grant cautiously offers 80s BC. There is no information about Sallust's parents or family, except for Tacitus' mention of his sister. The Sallustii were a provincial noble family of Sabine origin. They belonged to the equestrian order and had full Roman citizenship. During the Social War Gaius' parents hid in Rome, because Amiternum was under threat of siege by rebelling Italic tribes. Because of this Sallust could have been raised in Rome He received a very good education. After an ill-spent youth, Sallust entered public life and may have won election as quaestor in 55 BC. However, there is no strict evidence about this, and some scholars suppose that Sallust did not become a quaestor — the practice of violating the cursus honorum was common in the last years of the Republic. He became a Tribune of the Plebs in 52 BC, the year in which the followers of Milo killed Clodius in a street brawl. Sallust then supported the prosecution of Milo. Sallust, Titus Munatius Plancus and Quintus Pompeius Rufus also tried to blame Cicero, one of the leaders of the Senators' opposition to the triumvirate, for his support of Milo. Syme suggests that Sallust, because of his position in Milo's trial, did not originally support Caesar. T. Mommsen states that Sallust acted in Pompey's interests (according to Mommsen, Pompey was preparing to install his own dictatorship). 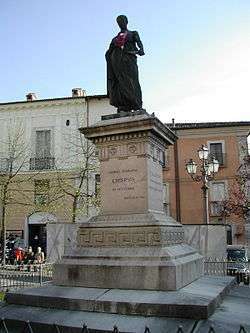 During the Civil War of 49–45 BC Sallust acted as Caesar's partisan, but his role was not significant, so his name is not mentioned in the dictator's Commentarii de Bello Civili. It was reported that Sallust dined with Caesar, Hirtius, Oppius, Balbus and Sulpicius Rufus on the night after Caesar's famous crossing of the Rubicon river into Italy on 10 January. In 49 BC Sallust was moved to Illyricum and probably commanded at least one legion there after the failure of Publius Cornelius Dolabella and Gaius Antonius. This campaign was unsuccessful. In 48 BC he was probably made quaestor by Caesar to re-enter the Senate. However, the last statement is based on the "Invective against Sallust" ascribed to Cicero, which is probably a later forgery. In late summer 47 BC a group of soldiers rebelled near Rome, demanding their discharge and payment for service. Sallust, as praetor designatus, with several other senators, was sent to persuade the soldiers, but the rebels killed two senators, and Sallust narrowly escaped death. In 46 BC, he served as a praetor and accompanied Caesar in his African campaign, which ended in the decisive defeat of the remains of the Pompeian war party at Thapsus. Sallust did not participate in military operations directly, but he commanded several ships and organized supply through the Kerkennah Islands. As a reward for his services, Sallust was appointed governor of the province of Africa Nova — it is not clear why: Sallust was not a skilled general, and the province was militarily significant, with three legions deployed there. Moreover, his successors as governor were experienced military men. However, Sallust successfully managed the organization of supply and transportation, and these qualities could have determined Caesar's choice. As governor he committed such oppression and extortion that only Caesar's influence enabled him to escape condemnation. 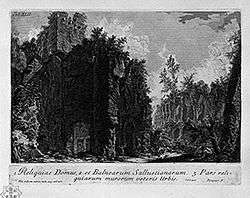 On his return to Rome he purchased and began laying out in great splendour the famous gardens on the Quirinal known as the Horti Sallustiani or Gardens of Sallust. These gardens would later belong to the emperors. Sallust's account of the Catiline conspiracy (De coniuratione Catilinae or Bellum Catilinae) and of the Jugurthine War (Bellum Iugurthinum) have come down to us complete, together with fragments of his larger and most important work (Historiae), a history of Rome from 78 to 67 BC, intended as a continuation of Cornelius Sisenna's work. The Conspiracy of Catiline (Sallust's first published work) contains the history of the memorable year 63. Sallust adopts the usually accepted view of Catiline, and describes him as the deliberate foe of law, order and morality, and does not give a comprehensive explanation of his views and intentions. (Catiline had supported the party of Sulla, whom Sallust had opposed.) Mommsen has suggested that Sallust particularly wished to clear his patron (Caesar) of all complicity in the conspiracy. The work does not have any traces of personal experience, and the most common explanation is Sallust's military service during this period. The main source for this work is De Consulatu Suo by Cicero. Sallust's Jugurthine War is a brief monograph recording the war against Jugurtha in Numidia from c. 112 BC to 105 BC. Its true value lies in the introduction of Marius and Sulla to the Roman political scene and the beginning of their rivalry. Sallust's time as governor of Africa Nova ought to have let the author develop a solid geographical and ethnographical background to the war; however, this is not evident in the monograph, despite a diversion on the subject, because Sallust's priority in the Jugurthine War, as with the Catiline Conspiracy, is to use history as a vehicle for his judgement on the slow destruction of Roman morality and politics. The extant fragments of the Histories (some discovered in 1886) show sufficiently well the political partisan, who took a keen pleasure in describing the reaction against Sulla's policy and legislation after the dictator's death. Historians regret the loss of the work, as it must have thrown much light on a very eventful period, embracing the war against Sertorius (died 72 BC), the campaigns of Lucullus against Mithradates VI of Pontus (75-66 BC), and the victories of Pompey in the East (66-62 BC). Two letters (Duae epistolae de republica ordinanda), letters of political counsel and advice addressed to Caesar, and an attack upon Cicero (Invectiva or Declamatio in Ciceronem), frequently attributed to Sallust, are thought by modern scholars to have come from the pen of a rhetorician of the 1st century AD, along with a counter-invective attributed to Cicero. At one time Marcus Porcius Latro was considered a candidate for the authorship of the pseudo-Sallustian corpus, but this view is no longer commonly held. Consider his use of archaic words. According to Suetonius, Lucius Ateius Praetextatus (Philologus) helped Sallust to collect them. R. Syme suggests that Sallust's choice of style and even particular words was influenced by his antipathy to Cicero, his rival, but also one of the trendsetters in Latin literature in the 1st century BC. "The Conspiracy of Catiline" reflects many features of style that were developed in his later works. Sallust avoids common words from public speeches of contemporary Roman political orators, such as honestas, humanitas, consensus. In several cases he uses rare forms of well-known words: for example, lubido instead of libido, maxumum instead of maximum, the conjunction quo in place of more common ut. He also uses the less common endings -ere instead of common -erunt in the third person plural in the perfect indicative, and -is instead of -es in the accusative plural for third declension (masculine or feminine) adjectives and nouns. Some words used by Sallust (for example, antecapere, portatio, incruentus, incelebratus, incuriousus), are not known in other writings before him. They are believed to be either neologisms or intentional revivals of archaic words. Sallust also often uses antithesis, alliterations and chiasmus. His books were sometimes used by authors of the 1st and 2nd centuries AD, especially after imitations of archaic style gained popularity. Among those who borrowed information from his works were Silius Italicus, Lucan, Plutarch, and Ammianus Marcellinus. Fronto used ancient words collected by Sallust to provide "archaic coloring" for his works. In the 2nd century AD Zenobius translated his works into Ancient Greek. During the Late Antiquity and Early Middle Ages his works retained their popularity, and some influential early Christian theologists (Marcus Minucius Felix and Augustine of Hippo) knew his writings well. In the Middle Ages Sallust's works were often used in schools to teach Latin. His brief style influenced, among others, Widukind of Corvey and Wipo of Burgundy. In the 13th century Sallust's passage on the expansion of the Roman Republic (Cat. 7) was cited and interpreted by theologian Thomas Aquinas and scholar Brunetto Latini. During the Late Middle Ages and Renaissance Sallust's works began to influence political thought in Italy. Among many scholars and historians interested in Sallust, the most notable are Leonardo Bruni, Coluccio Salutati and Niccolo Machiavelli. Petrarch also praised Sallust highly, though he primarily appreciated his style and moralization. During the French Wars of Religion, "De coniuratione Catilinae" became widely known as a tutorial on disclosing conspiracies. Among his admirers in England were Thomas More, Alexander Barclay and Thomas Elyot. Justus Lipsius marked Sallust as the second most notable Roman historian after Tacitus. Manuscripts of his writings are usually divided into two groups: mutili (mutilated) and integri (whole; undamaged). The classification is based on the existence of the lacuna (gap) between 103.2 and 112.3 of the Jugurthine War. The lacuna exists in the mutili scrolls, while integri manuscripts have the text there. The most ancient scrolls which survive are the Codex Parisinus 16024 and Codex Parisinus 16025, known as "P" and "A" respectively. They were created in the 9th century AD, and both belong to the mutili group. Both these scrolls include only Catiline and Jugurtha, while some other mutili manuscripts also include Invective and Cicero's response. The oldest integri scrolls were created in the 11th century AD. The probability that all these scrolls came from one or more ancient manuscripts is debated. Several fragments of Sallust's works survived in papyri of the 2nd—4th centuries AD. Many ancient authors cited Sallust, and sometimes their citations of Histories are the only source for reconstruction of this work. But its significance for the reconstruction is uncertain, because occasionally the authors cited Sallust from memory, and some distortions were possible. ↑ Dando-Collins, Stephan (2002). The Epic Saga of Julius Caesars Tenth Legion and Rome. p. 67. ISBN 0-471-09570-2. ↑ (Mart. XIV, 191) Martial. Epigrams, XIV, 191: Hic erit, ut perhibent doctorum corda virorum, // Primus Romana Crispus in historia. ↑ Osmond P. J. Princeps historiae Romanae: Sallust in Renaissance political thought // In: Memoirs of the American Academy in Rome. — 1995. — Vol. 40. — P. 107ff. Lemprière, John. A Classical Dictionary. London: Cadell & Davies, 1820; p. 683. This article incorporates text from a publication now in the public domain: Chisholm, Hugh, ed. (1911). "Sallust". Encyclopædia Britannica (11th ed.). Cambridge University Press.